This comprehensive guide to the history of literary criticism from antiquity to the present day provides an authoritative overview of the major movements, figures, and texts of literary criticism, as well as surveying their cultural, historical, and philosophical contexts. M.A.R. Habib is Associate Professor of English at Rutgers University. He received his D.Phil. in English from Oxford University, and is the author of five books, including Modern Literary Criticism and Theory: A History (Blackwell, 2007). Frantz Fanon, Edward Said, Gayatri Chakravorty Spivak, Homi Bhabha, Henry Louis Gates, Jr.
"This is a book to be read cover to cover, and those who undertake that happy task will be better informed. They will understand the twin pillars of Western civilization, Hellenism and the Judaic Christian ethic. They will understand the intersections of philosophy, literature, and religion. They will understand Plato, Aristotle, the Age of Enlightenment, Romanticism, and the three great thinkers who forever shifted thought at the beginning of the 20th century: Marx, Freud, and Darwin. Dividing the discussion into eight chronological sections, from ancient Greece to the 20th century, Habib (English, Rutgers Univ.) discusses each period in detail, exploring major critical figures and their works in a way that illuminates, rather than exhausts, the issues they are concerned with. His explorations entice one to read more, and that is the best kind of criticism. Summing Up: Essential. All readers; all levels." "Philosophically sophisticated and full of fascinating connections and distinctions ...a monumental achievement." 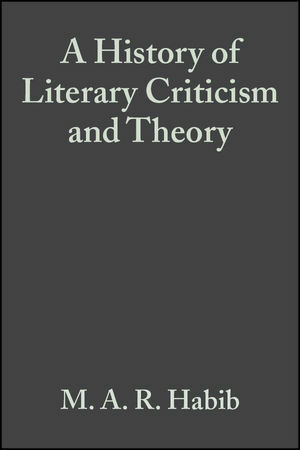 "This huge undertaking offers a comprehensive, expository and lucid account - including close readings of selected formative texts - of the history of literary criticism and theory from the earliest western classics to influential contemporary movements, while also embedding these in their broader social, cultural and philosophical contexts. A major resource - as narrative or as compendium - for students at all levels." "Beginning with Plato and Aristotle, Habib traces how the study of literature evolved in the West. His strength lies in his short segments, which allow readers to absorb the major thoughts of the critics and movements without being overwhelmed. While the book runs nearly 900 pages, it is easy to maneuver. All told, Habib delivers an accessible yet scholarly survey of literary criticism."